I guess I really wouldn't call this a weekly update. More like a monthly update. But whatever, right! At least it's finally done! I had yet another mishap that kept me from blogging. Alex broke the screen on my laptop! 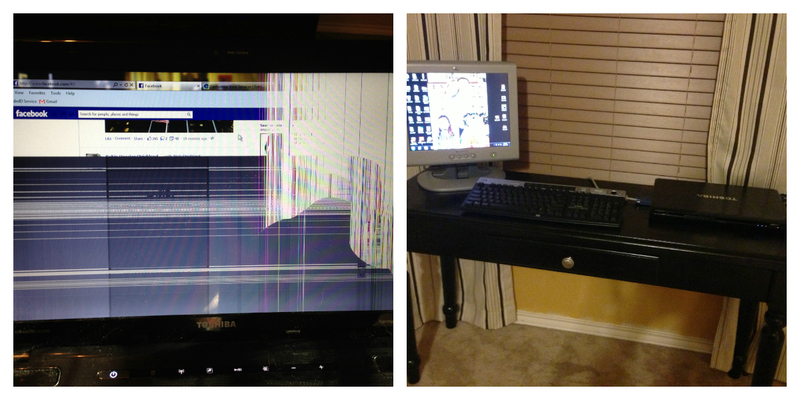 He threw the lid to the cookie jar & it hit the laptop & broke the screen. It didn't break the glass, but the lcd screen underneath. And I can't blog from my iPad. I really don't want to spend the money on a new laptop, especially when all I use it for is blogging & the checkbook. So I hooked it up to an old monitor & now it works! One of Addy's permanent teeth came in 6 months ago & her baby teeth were still not loose, so on January 7th she had to go to the dentist & get 2 teeth pulled. They made her drink some medicine, wait 30 minutes & then they gave her gas. She laid perfectly still and did great! She had one more baby tooth on the bottom that was loose & the dentist said it would probably come out soon. It actually fell out in the car before we even left the dentist! She had to wear a mouth guard for a couple of hours til the numbness wore off. Luckily she sleep most of that time. That night she left her teeth for the tooth fairy in a cute little pillow underneath her pillow. The tooth fairy left her 6 quarters. (I asked her what she thought the tooth fairy would bring her & she said coins, so coins she got!) And since the swelling & bruising went away, she has a cute little missing tooth smile! Here she is before her procedure. Sleeping afterwards With her tooth fairy pillow showing off her coins And her new smile! And Addy played 'speed', that's what she calls walking on the treadmill, lol. Addy made a teacup & saucer with a piece of yarn. She learned how to do this in OT. I got a new car! And yes, I know it's just like my old car! You live & learn & I learned I should have kept my old Tahoe. 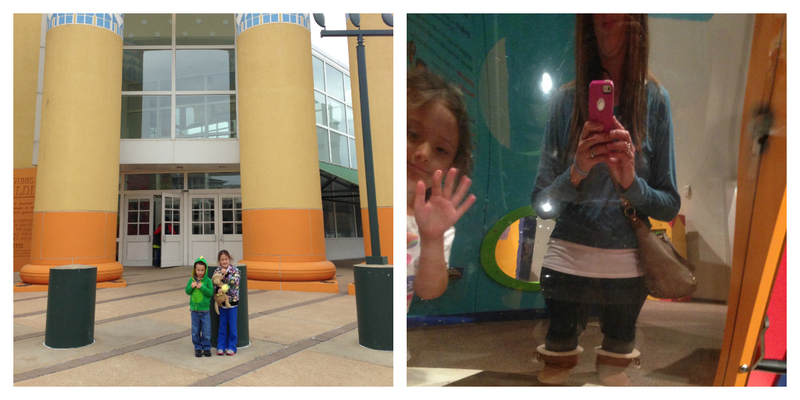 On January 13th we met Jessica and Peyton at the Children's Museum. The other day, we were just sitting around doing who knows what. Addy walks into the kitchen (where I'm at) and looks like this! 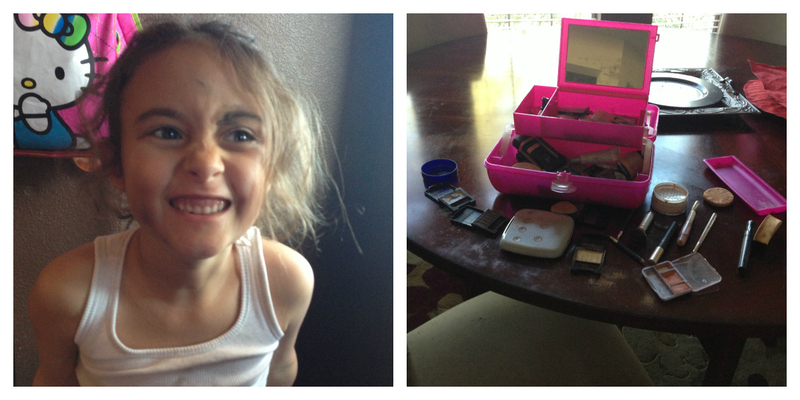 I asked her what she had all over her & she said makeup. And then she shows me this, all my makeup all over the dining room table! So that's some of the stuff we've been doing this month but I've still got plenty of pictures to share with you. Hopefully I'll get them posted later this week. This past Thursday was the end of the first semester of Addy's dance class. So they performed a little mid season showcase to show the parents all the skills they've been working on. I was able to get a few videos to share with you guys. Here is her tap routine. And here is her ballet routine. Then they went into the gym and did a couple different gymnastic moves. Here she is doing her somersaults. And here she is on the bar. And on the balance beam. All the girls in the class got an award for completing the first semester of the class. And here she is with all the girls in her dance class. It was a great little show & I was (and still am) SO SO PROUD of Addy! She did a fantastic job following along to the routines & she just amazes me every day! On Christmas evening, we went to my Aunt Susan's house to celebrate with the Roeders, my mom's side of the family. My papa & his wife June, my Aunt Susan, my Aunt Christy, my Uncle Steve, my cousins & all their sweet kids were there. I love them all so much & it was so great to see them! We really should get together more often! We left my mom & dad's house around 4:00 pm on Christmas Eve so that we could make it home in time for Addy & Alex to open their Christmas presents from us. 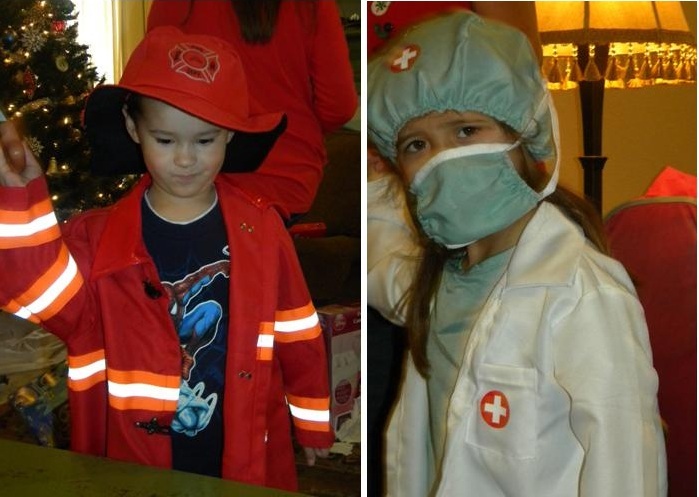 Alex insisted on changing into his new Thomas the Train dress up clothes before opening his presents. But Addy was ready to dig in! & then it was time for bed so that Santa Claus could come. Santa had a very specific request from Addy. She wanted a pink polka dotted elephant, just like the one on Rudolph the Red Nosed Reindeer. 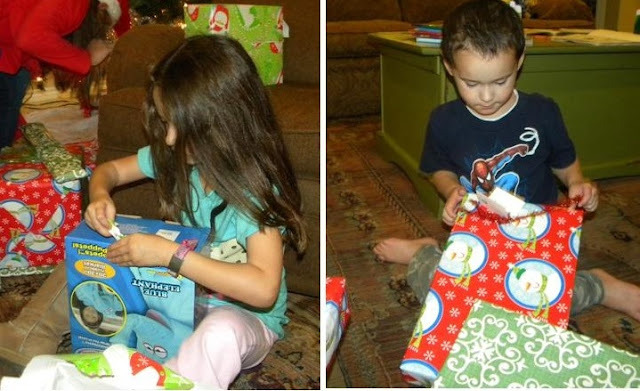 Well, Santa had a hard time finding a pink polka dotted elephant, but luckily his little elves were able to make one! Addy woke up first on Christmas morning. Then she went & woke Alex up so he could see what Santa brought. All Alex wanted Santa to bring him was a big brown car that he could drive on the street. Santa couldn't find a brown one, but he did find this awesome red one & Alex loves it! 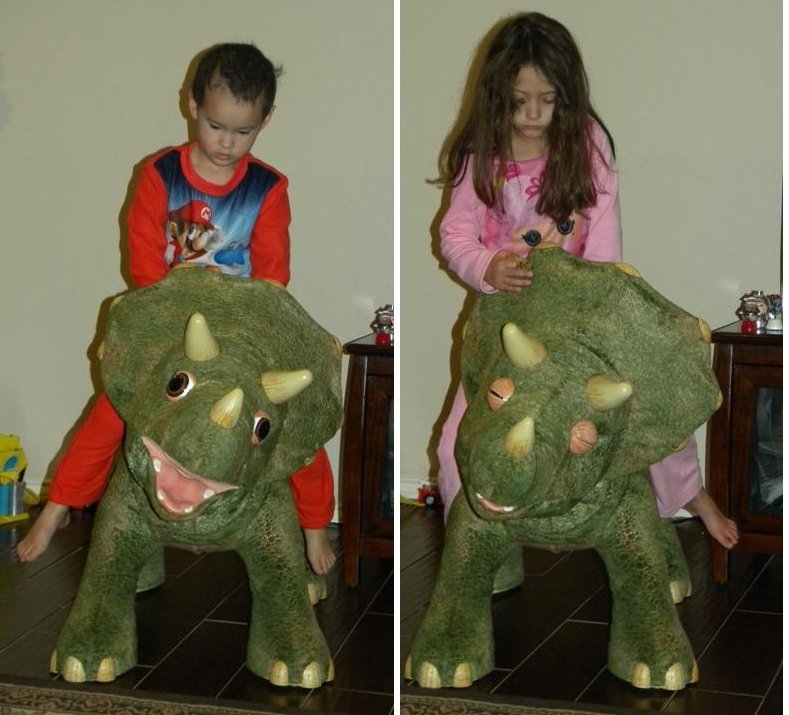 Santa also brought the kids this giant triceratops that growls & roars. As soon as it was light enough, we went outside & let Alex ride around in his new car. And Addy ride her scooter. "Hop in Addy, I'll give you a ride!" I think Santa did good! We celebrated Christmas with my side of the family on Christmas Eve day. It was a beautiful, warm day (that's Texas weather for you) and we spent lots of time playing outside. 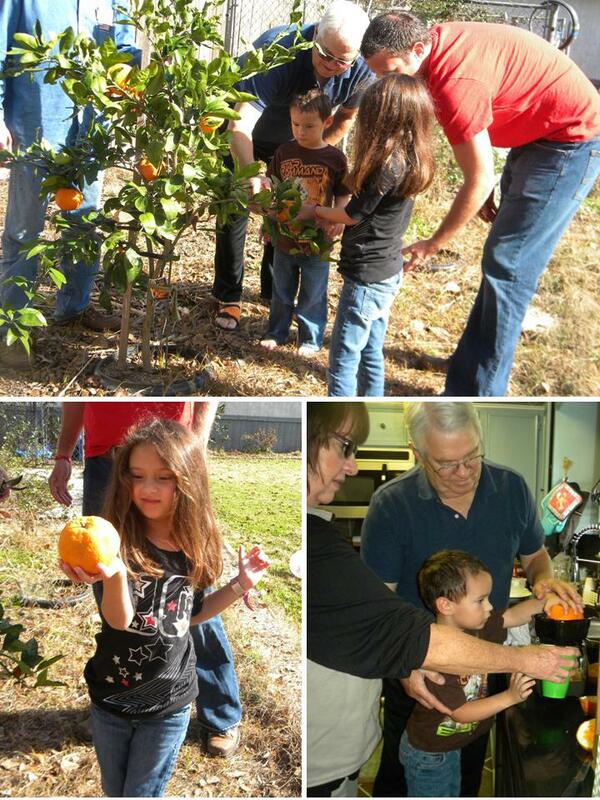 Alex conned PopPop into letting him pick oranges and make fresh squeezed orange juice! Addy took Uncle Mike outside & made him play volleyball with her! It was pretty cute watching them play. And my favorite picture from the day... This is classic us! That's right, I'm finally posting my Christmas pictures! Well some of them anyway. 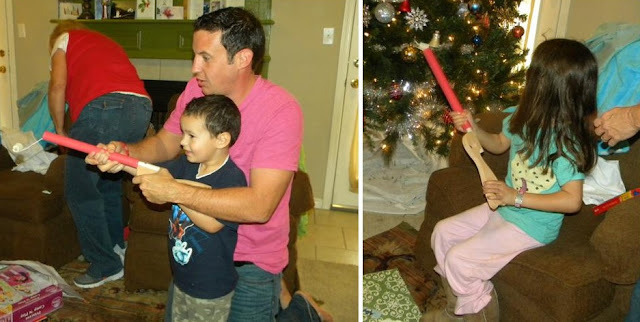 I'm going to write a couple different blogposts, one for each Christmas celebration we had. I'll start with our Christmas with Nick's parents, since that is the first one that we had. a pop gun and more! 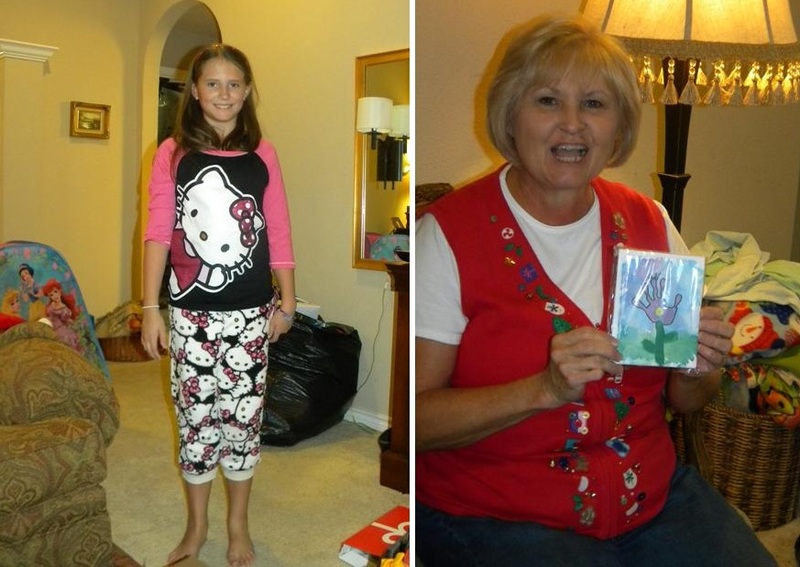 Jules got a really cute pair of Hello Kitty pajamas & Pat loved her note cards made from Addy's painting! Grant got a micro mini car racetrack that all the kids had fun playing with! 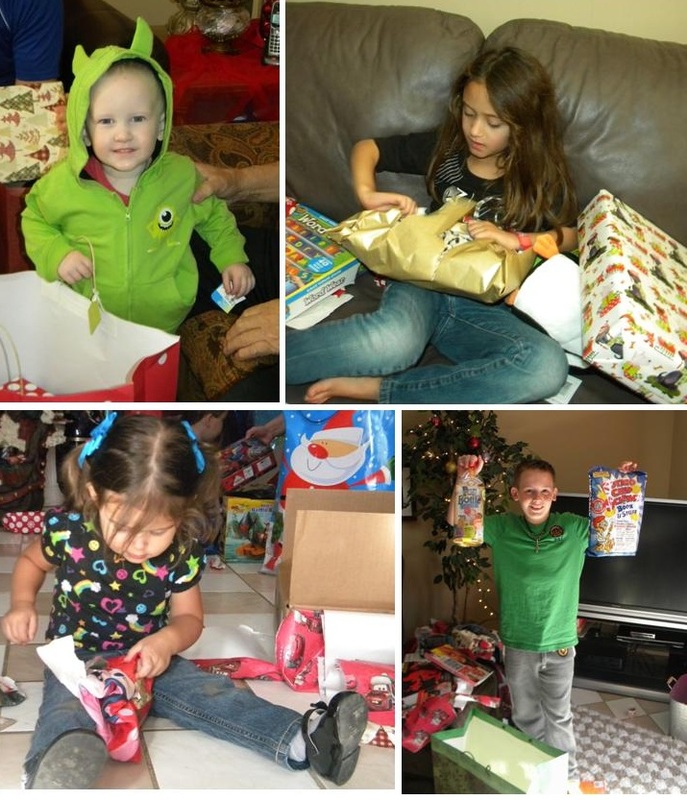 We had a great Christmas with Nick's family & thanks to everyone for all the wonderful gifts! I know you have all been anxiously awaiting my pictures from Christmas, lol. Sorry it's taken me so long, but the button to upload pictures in a blogger post disappeared! I kept checking back, thinking it was just a mistake, but it's been over a week now so I googled it & apparently it's just happening in Internet Explorer. So I ended up downloading the Google Chrome browser today & will hopefully have my pictures posted for you either tomorrow or Wednesday. A week or 2 before Christmas, Addy made a book called Merry Christmas Sing Song. It's a book of Christmas carols. She made the book & then INSISTED that I take her caroling. So at first, I told her to carol at our house. I told her to go outside & ring the doorbell. She did & here are some videos of Addy caroling at our house. Caroling at our house did not satisfy her, so I brought her to a friend from school's house one night & then to 2 of her teachers' houses another night. Alex went too, but he refused to sing. This video is of Addy caroling at her friend's house. I don't know about you, but I think Addy singing might be the cutest thing ever!